Our geologists and scientists provide environmental, geological, hydrogeological and geophysical services for all phases of your construction project. 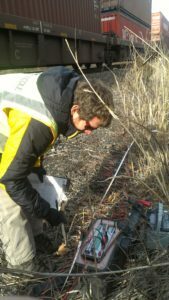 A geoenvironmental team member performing infiltration testing. Managed by a group of certified and professional geologists, S.W.COLE’s geoenvironmental division is able to offer a diverse range of environmental, geological, hydrogeological and geophysical services. Our geoprofessionals provide services ranging from pre-construction evaluation of a project to exploring ways to protect the land and groundwater after its development. Our geoenvironmental services include hydrogeology, groundwater and contaminant transport monitoring, resistivity and conductivity evaluations, seismic risk analysis, wellhead protection and geothermal well assessments and water resource evaluations.